Good Morning! Today’s Retirement Planner is inspired by the recent weekend I spent on the campus of my alma mater, the University of Pennsylvania. Having athletic contests, theater, art exhibits and the excited buzz of campus life to spark your spirit right at your fingertips is an envied way to live. Sawgrass Country Club, FL: Oceanfront living, near art school. > Sawgrass Country Club, Ponte Vedra Beach FL is an oceanfront community just 30 minutes north of historic St. Augustine with 1,250 acres of luxury and stylish amenities. Just a short drive away is a large and growing outpost of the state’s university system. Live near one of the largest performing arts centers in north FL. Check Out: The UNF Fine Arts Center, one of northeast Florida’s largest performing arts venues. UNF’s Division of Continuing Education offers non-credit course and certificate programs. For-credit courses, and certain professional certification and recertification courses, are offered in business, arts and sciences, the College of Computing and more. Send me more information about Sawgrass Country Club! Brier Creek Country Club, FL: Resort living, CE opps nearby. UNC has a new CE center for lovers of learning. Check Out: UNC’s recently established a Center for Continuing Education, which offers a broad range of educational opportunities for part-time students and adult learners. Send me more information about Brier Creek! The Osher Lifelong Learning Institute offers courses, events, trips. groups, including from two book clubs and a photography group. Send me more information about Brier Creek! NCSU’s McKimmon Center offers a broad range of courses. Get Smarter: NC State’s McKimmon Center for Continuing Education serves adult learners interested in a wide array of subjects and new skills. It’s all part of what is the largest university in the Carolinas. Send me more information about Brier Creek! Connestee Falls, NC: Beautiful setting, close to the action. > Connestee Falls, Brevard NC is a private gated community in the Western North Carolina mountain college town of Brevard. Plenty of annual events and festivals take place in Brevard, including diverse musical offerings at the renowned Brevard Music Center and local and regional theatrical venues and theatre troupes. Brevard College is right in town, serving as an excellent lifestyle asset. Send me more information about Connestee Falls! The Tornados are a big athletic draw. Check Out: The full slate of athletics. Brevard is a selective private college founded in 1853 covering 120 acres in a rural setting. The Brevard College Tornados compete in the NCAA Division II as a member of the South Atlantic Conference and fields athletic teams in baseball, basketball, cheerleading, cross country, cycling, football, golf, soccer, softball, tennis, track and field, and women’s volleyball. Send me more information about Connestee Falls! Daniel Island, SC: Award-winning town near college theater. > Daniel Island, Charleston SC is known as “Charleston’s Island Town’ and was envisioned from the start as a “new urbanist” community. As a bonus, one of the true “hot schools” for undergrad education of the past decade is just around the corner. Send me more information about Daniel Island! Digital media students hard at work. Check Out: C of C’s full menu of theater and dance productions, C of C offers many non-credit continuing education courses for professional and personal enrichment. Intensive English language courses, technology and financial planning certificates, and courses tailored to business and community needs are among the offerings. Fun Fact: The C of C was established in 1770 and has three founders who went on to sign the Declaration of Independence. Send me more information about Daniel Island! > The Reserve at Lake Keowee, Sunset SC is a private, 3,900-acre golf and recreational community set on the shores of Lake Keowee in the foothills of the Blue Ridge Mountains. Lake Keowee’s crystal clear water is considered one of the purest South Carolina lakes. The community has a deep connection with nearby Clemson, so much so that its Great Lawn features a half-sized football field featuring a Clemson Tiger paw painted from the same stencil employed at Clemson’s Memorial Stadium. Send me more information about The Reserve at Lake Keowee! 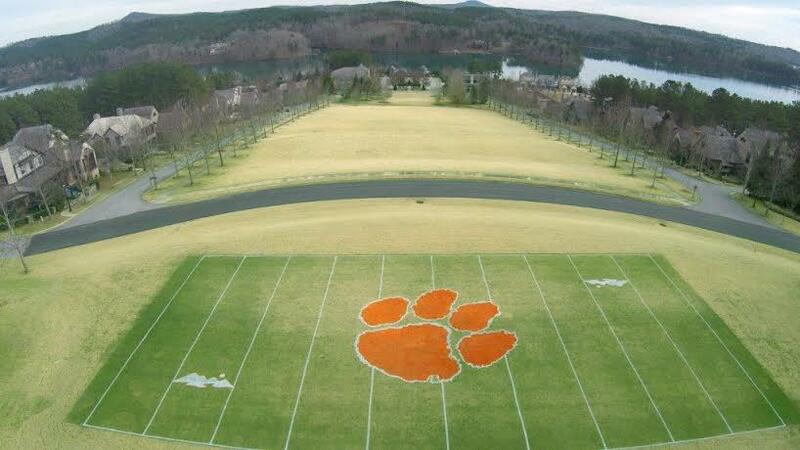 The Reserve at Lake Keowee shows major support for Clemson. Check Out: Its entrepreneurial programs and living-learning communities. A Top 25 U.S. News & World Report university, Clemson is divided into five colleges with more than 80 majors. Clemson’s largest enrollment is in engineering and science, followed by business and behavioral sciences. Send me more information about The Reserve at Lake Keowee! The Cliffs at Keowee Springs, SC: Great golf, close to Clemson. > The Cliffs at Keowee Springs, Six Mile, SC is set along Lake Keowee, pairing a relaxed, recreational lakefront lifestyle with energy and culture, embodied by the community’s neighboring college, Clemson University. Keowee Springs is one of The Cliffs’ most family-friendly communities. Perched on a hillside overlooking the crystal-clear lake, The Beach Club at The Cliffs at Keowee Springs is a hub of activity from spring to fall as members and families soak up the sunny days. Send me more information about The Cliffs at Keowee Springs! Clemson University is just 20 minutes from The Cliffs at Keowee Springs. Check Out: [ See above ] Send me more information about The Cliffs at Keowee Springs!